I took a look at my 2012 synopsis of the show, and I liked what I wrote. Here it is again (the show didn’t change 🙂 ). It started by noting the show is framed by the aforementioned “Time to Remember”. This is truly a fringe show. A platform, some boxes of props, paper, and simple curtains. You can move it in and out in 15 minutes (which is good, because that’s about what the Fringe folks give you). Small cast. Simple music. To do more to the story would destroy it; perhaps that’s why the film was so problematic. Performance-wise, this was wonderful. Let’s start with their El Gallo, a role that was originally played by Jerry Orbach. Alas, they can’t dig up and clone Orbach. One problem with the Theatre West production was that their Gallo, Lukas Bailey (FB), had the acting down but was weak on the singing. Good People’s Gallo, Christopher Karbo (FB), was spot on. He had the handsome good looks, he had the manner and the swagger, he had the playfulness, and most importantly, he had a lovely voice. He was a very strong Gallo, and a joy to watch when he was narrating, singing, and fighting. As Luisa, Audrey Curd (FB) was wonderfully expressive. Her face and her movements perfectly captured the emotions of a 16-year-old, and were a delightful. Her singing, for the most part, was also quite good (there were one or two slightly-off notes, but not enough to hinder my enjoyment of her work). I particularly enjoyed her during the “Round and Round” number, her expressions in “This Plum is Too Ripe”, and her joy and enthusiasm in “Much More”. Matt, portrayed by Matt Franta (FB), was just a little weaker. He captured the 20-year old boy well, and again had strong facial expressions. At the show I was at, he had a few more off-notes on the songs — nothing wince-worthy, mind you, but just slightly off to my ear. Overall, though, the performance worked well. My favorite characters in this piece are the fathers. Perhaps this is because they get my favorite songs, and perhaps because I’m a father myself. They’ve got some of the best comic relief and characters, and their observations on children are spot on. The two performers lucky to fill these shoes were Matt Stevens (FB) as Hucklebee and Michael P. Wallot (FB) as Bellomy. Both were in “Man of No Importance“, and both were great. Not surprisingly, I loved them in “Never Say No” and “Plant a Radish”, but they were also exceptional in “This Plum is Too Ripe”. They just seemed to enjoy each other’s company; you could see them as realistic neighbors. Rounding out the cast were Joey D’Auria (FB) as Henry, the Old Actor; Corky Loupé (FB) as Mortimer, the man who dies; and Alix Rikki Ogawa (FB) as the Mute. When we saw the Theatre West production, the mute was played by Lee Meriwether, who gave a much older, more stern and traditional mute-ish portrayal. Ogawa’s mute was delightful. Young, playful, silent, there when you need her, and providing a humorous expression that just provided commentary without words. D’Autia captured the old actor well, perhaps because of his experience (although not in this program, the Ionescopade program noted he is a former Bozo the clown from Chicago). As for Loupe, well, he died well :-). Turning to the technical: The set for this production, as noted above, is simple. Some boxes, a raised platform, some poles, a bench, a chair. The rest is all created. Robert Schroeder (FB) handled the task well. Lighting was handled by Katherine Barrett (FB), who also took care of stage management. There were more problems here (that is, with the lighting, not the stage management) — most of which I attribute to the Fringe, the nature of quick move out, and the sharing of theatres. In particular, at some points characters were in shade and difficult to see. Kathy Gillespie (FB) did the costumes, and these worked quite well — especially during the opening scene where they suddenly appear dressed. Rounding out the credits, Michael P. Wallot did the casting, the aforementioned Kimberly Fox did marketing, Rebecca Schroeder (FB) was the assistant stage manager, Oliver Lan did the graphic design, Kevin Gardner did the program design, and Zach Payne did social media. “The Fantastiks” was produced by Good People Theatre (FB). 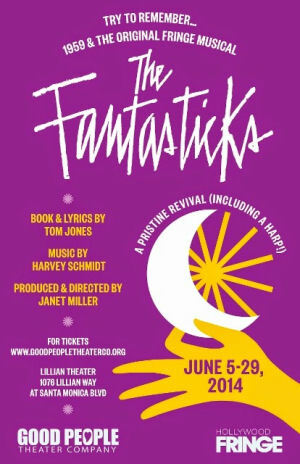 “The Fantastiks” runs through June 29; performances are at the Lillian Theatre, 1 block W of Vine on Santa Monica. You can purchase tickets from the Fringe Web Site. All this week, I have been writing and obsessing about the situation with Repertory East Playhouse. You can find the background on the story and information from those who were there in this post. I encourage you to read it and draw your own opinions. I’ve been a subscriber at REP for many years, and have seen many shows there. In this time of unjustified Internet outrage, the REP needs your support to survive. Donations are always encouraged, and the REP has a one-week booster campaign going to make up for funds lost due to the unexpected cancelling of Cat. Additionally, encourage those complaining about the REP to actually come and visit the theatre for a future show, and see what this theatre really is. 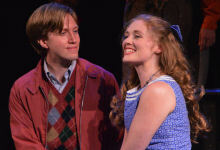 The remainder of the REP season is: “Return to the Forbidden Planet (A Jukebox Musical retelling of Shakespeare’s “The Tempest”)” (July 11-August 16, 2014); “The Great Gatsby” (September 12-October 18, 2014), and “Sherlock Holmes and the Adventure of the Suicide Club” (November 14-December 13, 2014). Tickets are available through the REP online box office. Most importantly — and the reason I’m mentioning it in this post — REP will be hosting a town hall style meeting to discuss issues of discrimination in the LGBTQ community on Sunday June 22 at 6pm at the REP (Pending Reschedule). There will be a panel discussion, a moderator and audience feedback and questions for local community leaders, REP alum etc. They will be discussing the role’s that bullying take and the way that as a community we can best respond. It must be clear: the REP does not stand for bullying in any way, shape, or form — and that includes bullying of members of the LGBTQ community (which is why this whole kerfluffle is odd — had management been informed, they would have had the heckler out of the auditorium and on his way in a Brooklyn Minute. They don’t put up with that nonsense.) #IStandWithTheRep. Upcoming Theatre and Concerts: We lose next weekend to a Bat Mitzvah — but I’m still squeezing in a concert at the Saban Theatre on Monday, June 16: “To Theo, L’Chaim to Life!” with Tom Paxton, Peter Yarrow, Arlo Guthrie, and more. The remainder of the month brings “Stoneface: The Rise and Fall of Buster Keaton” at the Pasadena Playhouse (FB) on June 22, and “I’m Not Just a Comic Genius” at Secret Rose (FB) on June 27. July will be busy: “Ghost” at the Pantages (FB) on 7/5, “Return to the Forbidden Planet” at REP East (FB) the weekend of 7/12, “Once” at the Pantages (FB) on 7/19, “Bye Bye Birdie” at Cabrillo Music Theatre (FB) on 7/26, and “Family Planning” at The Colony Theatre (FB) on 8/2. 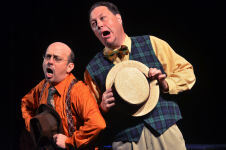 August then remains quiet as we work around vacations and such (but I’m eyeing a number of productions in Escondido, including “Two Gentlemen of Verona” at the Old Globe, and “Pageant” at the Cygnet in Old Town. What they have at the Welk (“Oklahoma“), Patio Theatre (“Fiddler on the Roof“), and Moonlight Stage (“My Fair Lady“) are all retreads. Things start to get busy again in September and October, with “The Great Gatsby” at REP, “What I Learned in Paris” at the Colony, and “Pippin” at the Pantages. More on that later. As always, I’m keeping my eyes open for interesting productions mentioned on sites such as Bitter-Lemons, and Musicals in LA, as well as productions I see on Goldstar, LA Stage Tix, Plays411.